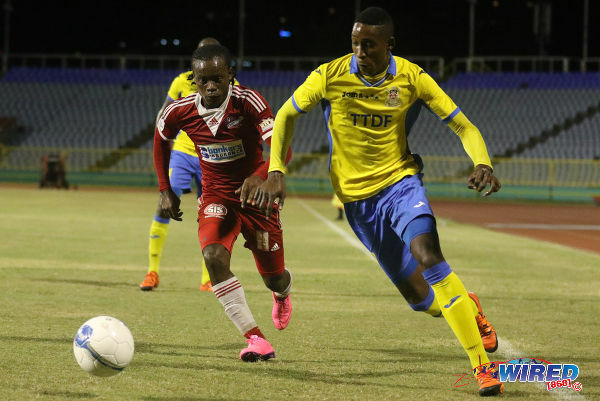 Defending Digicel Pro League champion Defence Force is just three games away from the most unlikely title defence in Trinidad and Tobago’s professional era. Photo: Defence Force players (from left) Josimar Belgrave, Rodell Elcock and Curtis Gonzales celebrate during 4-0 conquest of Caledonia AIA. 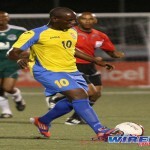 In a rescheduled fixture this evening at the Ato Boldon Stadium in Couva, the “Teteron Boys” kept the pressure on current leader, DIRECTV W Connection, after a 4-0 win against Caledonia AIA. And, after seeing off the challenge of Central FC, Connection coach Stuart Charles-Fevrier now has Defence Force coach Ross Russell breathing down his neck. Connection and Defence Force will face each other twice on May 2 and May 6 and, for all the rancour of tonight’s Lucozade Sport Goal Shield final against bitter Couva rivals Central FC, it is those two league matches that matter most to either club. Before kick off, a Defence Force official handed out flyers for a barbeque fund raiser for the family of late winger Kevon Carter, which will be held on 30 May 2014 at the Diego Martin Recreational Ground. It was a reminder of the grave misfortune that the army/coast guard combination has endured this season. And yet here stand Russell’s troops, just one point behind a Connection team that once had a double digit lead over the rest of the Pro League. This evening, Caledonia AIA was Defence Force’s ninth successive Pro League victim although, for the first hour, the regiment saw little of the ball. If anything, Keyon Edwards, Caledonia’s silky dreadlocked striker, was the game’s outstanding player with his adhesive touch and efficient distribution. 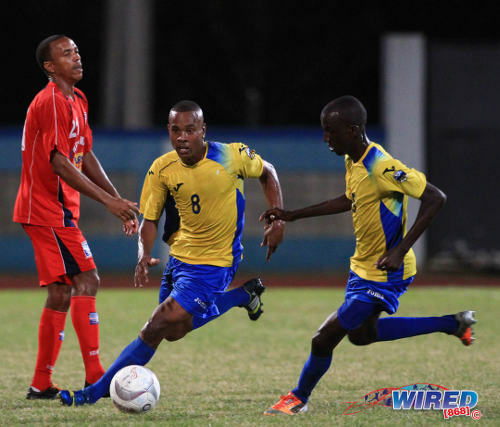 Photo Defence Force midfielder Curtis Gonzales (centre) advances alongside teammate Jerwyn Balthazar (right) while Caledonia AIA playmaker Densill Theobald looks distraught. Like deadly snipers, Defence Force lay low and waited for their opportunities. 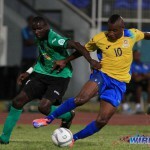 Devorn Jorsling and Richard Roy were both missing so Russell pushed midfielder Josimar Belgrave upfront to the role he once held with St Ann’s Rangers. And Belgrave showed he has not lost his predatory instinct. Three times, Belgrave collected the ball inside the Caledonia penalty area. And, three times, Caledonia goalkeeper Shemel Louison had to pick the ball out of the back of his net. On the first occasion, Belgrave stroked through Louison’s legs in the 29th minute. In the 69th minute, he headed in from point blank range after a brilliant left side cross from Ross Russell Jr and his third was even simpler as he rolled into an empty net in the 81st minute after substitute Balondemu Julius knocked the ball around Louison. Each goal was a tribute to his good positioning and steady nerves. Belgrave had a hand in Defence Force’s fourth goal too albeit with a scoffed shot that midfielder Curtis Gonzales banged home despite cries of offside from Caledonia. Photo: Defence Force players Josimar Belgrave (left) and Curtis Gonzales celebrate as the defending champions pulled within a point of the Pro League summit. 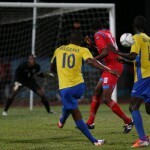 A win and draw in their next two games against Connection would virtually ensure that Defence Force successfully defends its league title; and it will only the fourth time that has happened—San Juan Jabloteh did it twice in 2002 and 2003 and 2007 and 2008 while Connection managed it in the 2000 and 2001 seasons. The 2013/14 Pro League season has boiled down to a two-legged play off. And a million dollars is at stake. Defence Force (4-2-3-1): 1.Kevin Graham (GK); 14.Cory Rivers (captain), 3.Keston Williams, 6.Rodell Elcock, 21.Aklie Edwards (31.Thurlani George 82); 4.Dave Long (7.Balondemu Julius 77), 8.Curtis Gonzales; 30.Akeem Roach (23.Kerry Joseph 66), 15.Jerwyn Balthazar, 17.Ross Russell Jr; 10.Josimar Belgrave. Unused substitutes: 25.Sheldon Clarke (GK), 5.Devin Jordan, 13.Marvin Jones, 18.Sean Narcis. Caledonia AIA (4-4-2): 1.Shemel Louison (GK); 2.Jabari Braithwaite (18.Denron Frederick 75), 3.Nuru Muhammad (captain), 5.Akeem Thomas, 6.Marcus Ambrose; 27.Nathan Lewis, 8.Keron Bethelmy, 21.Densill Theobald, 28.Pernell Schultz (24.Conrod Smith 60); 9.Keyon Edwards, 13.JulianWade (15.Aaron Lester 60). Unused substitutes: 34.Kevin Graham (GK), 12.Kareem Joseph, 22.Jameel Neptune, 30.Akil Stafford.